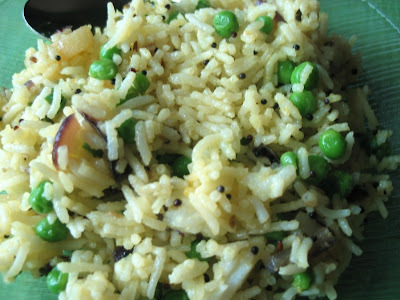 We all fry let over rice and lemon rice is my favorite recipe to make with them. But this time i thought of frying rice like maharastian aloo pohe. 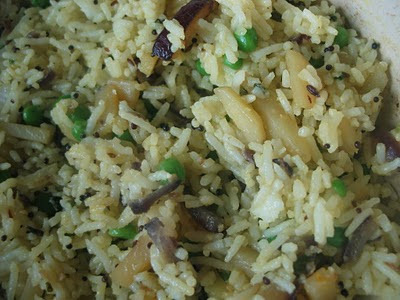 Sometime when rice is not enough i mix it with soaked pohe and prepare. Not everyone in my family is happy when i prepare left over rice for breakfast but i will give them funda about not throwing away food and make them eat :). 1. Heat a skillet with oil and add mustard seeds. 2. When they pop add cumin and cook for a minute. 3. Add onion , chili and potato cook till potato is almost done. 5. Add matar ,turmeric,salt and cook for 2-3 minutes. 6. Add rice and mix well. Add a tsp of lemon juice(optional). 7. Garnish with coriander leaves and serve with pickle. Sending this to APS -Rice event at Anita's Kitchen.